If a rap album complete with crisp lyrical content and neck-breaking beats dropped in the Northwest, would it make a sound? Dividenz, the latest lyrical duo to launch from Seattle, has released its debut album with the intentions of going far beyond being heard. Rather, Notes & C.O.L.A. are aiming to be felt…like a shot to the chest. It’s been said that rap lyrics are like bullets silencing weaker MCs. 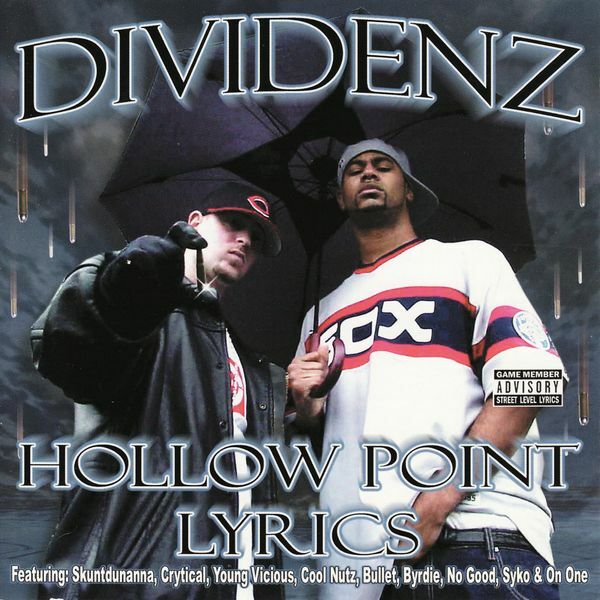 If that’s true, then Dividenz brings nothing but heat on their debut album, “Hollow Point Lyrics.” A soundtrack to the Seattle streets, “Hollow Point Lyrics” features Notes & C.O.L.A.’s machine gun lyrical attack with some of the Northwest’s most prolific MC’s riding shotgun. Underscoring the sheer talent residing in the Northwest, “Hollow Point Lyrics” features Street Level Records’ own Skuntdunanna, Crytical, Young Vicious and additional Puget Sound affiliates including Cool Nutz, Bullet, Byrdie, No Good, Syko and On One. Currently available at select stores throughout the Northwest and online at www.streetlevelrecords.com , “Hollow Point Lyrics” is but an introduction to one of the most talented rap duos to release verbal warfare on wax. Notes & C.O.L.A.’s versatile approach to Hip Hop explores the realities of their unique experiences while providing rap fans with an opportunity to witness true lyrical unison – a synergy between two artists seldom found in any genre of music. Founded in 1999, Dividenz has earned the respect of fellow underground artists long before the release of “Hollow Point Lyrics.” Featured on Mo-X & Lil G “Angry Souls,” Night Shield Ent. “Savage Alliance Compilation,” the “North Coast Rain Compilation” and Oxagin’s album “Finally;” Dividenz is in no way a newcomer to the rap game and their debut CD is proof that these two will be on target for years to come.